SLSFTA, the Free Trade Agreement entered into with Singapore – a world economic giant in a small patch of land with a small population – is the talk of the town today, considering the controversial nature of the 1,083-page document in terms of asymmetrical economies and trade policies of two countries in the midst of fast growth towards trade liberalism in Sri Lanka with the a liberalised state, grouping second in world ranking on liberalisation of economy. Foreign and trade policies are two sides of the same coin today, intermingled and interconnected giving priority to economies over traditional diplomatic considerations. WTO is in the apex of the trade agreements, arbitrations, and world trade affairs leading Singapore as the world centre on arbitration which is a highly technical and expensive affair for a poor and less legally-equipped country like Sri Lanka. Sri Lanka is a member of WTO and GATT General Agreement on Tarff and multinational agreements in which Sri Lanka obtained membership on 1.1.1948. Trade agreements were signed by two trade Ministers of the two nations in the presence of the two leaders of the countries indicating the importance and priority being the seventh largest trading partner dealing with 4% of total trade between the two countries. Trade agreements outline certain obligations with respect of trade in goods and services and provide protection for investors and intellectual property rights by giving away rights of the host country expecting benefits from the proposed agreement expected to be ratified and implemented after rigorous scrutiny protecting the national interest. The basic thesis of FTAs is economic integration for the participants whether bilateral or multi-lateral. Singapore is pressed for space and welcome fertile lands and ailing state enterprises to develop with their power of money and international bonds identifying Sri Lanka as an ideal candidate for their plans for expansion of the economic empire in a small community with large number of foreigners settled and citizens with combine ethnic origins. GOSL may genuinely expecting an opening to the commercial world via Singapore which a world economic giant in a tiny land in ASIAN. GOSL may be expecting to exploit ASIAN through Singapore document. Do we have/need a foreign/trade policy? Do we have a proper foreign policy or a trade policy are moot issues considered as basic foundations/requirements to be an active player in the current economic and world order whether small or big in the world family when Singapore – one of the most liberalised rules of origin in the world – has a clear cut foreign and trade policy as an world economic giant despite the smallness of the minute nation with no resources except human resources properly utilised. Singapore has rated second best in ‘Doing Business’ when Sri Lankan is at 111, indicating that we have to be extremely cautious in dealing with the rest of the world in business affairs we have been cheated from 1815 with political administrative and business agreements and dealings with the rest of the world. Trade agreements with India is a failure towards Sri Lanka and stalled with no progress and unable to make further progress due to political and economic mishandling due to want of the coherent and trade policy which Singapore is equipped with. It is mandatory and a requirement for a state to be equipped with a proper foreign and a trade policy to prosper in the family of nations. Do we prosper in the family of nations like Singapore well-equipped with a proper and coherent foreign and trade policy? Do we need Free Trade Agreements? Certainly yes to be an active and productive state in the world community without isolating ourselves in the highly-advanced and controversial maze in the most competitive setup with selfish players with their state-friendly temperaments however big or small. Bilateral and multilateral agreements with states and international organisations are binding and effective in the current vibrant economic and political world order and it is better to be cautious in the interest of the future generation and the country as a whole the governance appointed as temporary trustee is responsible for. Did we have a proper dialogue and consultation with the professionals and the concerned citizens when dealing with the second fastest economy in the world with 982 billion trades in 2014 despite offers to cooperate and take part in deliberations and whether a real transparency is and consultation as in Australia, Canada and most democratic models? The discussions were fast-tracked and one-sided may be with good intentions due to pressure and time frame but hurriedly drafted and prepared with 17 chapters and 1,083 pages available at modsit.lk as many similar legislation we are pressed on with adverse results when dealing with the second fastest economy in the world with political stability with people’s action party balancing the rest of the world including UN with the economic power behind. Singapore, a leader of the free economy, has links and control over airlines, telecom, engineering, media and many strategic areas and China having control of companies as Government as a partner. UK and Europe claiming to be free economy is careful to maintain self interest in major dealings with Singapore-friendly policies. We need Sri Lanka friendly foreign and trade policies for the future of the nation and the future generation awaking to take over from us with mistakes made and foundation for a bright future. What is the practice in other countries? Any country is careful in entering into comprehensive trade agreements with other states especially when the other party/s is asymmetrical and powerful economically and politically. In Australia and Canada adequate consultation with the public and debates in Parliaments are requirements to be fulfilled before ratification and implementation. EU and the satellite countries prefer multilateral giving priority to national interest over other considerations. In Australia 20 sittings and Canada 21 sittings on the matter is required before going through such legislation prior to implementation. The US has entered into trade agreements with 20 countries including Israel and Singapore with comprehensive agreements to open the economy to each other whilst SAFTA has integrated 1.6 billion SAARC as a vehicle when Sri Lanka, India and Pakistan have entered into trade agreements which are still in primitive stages with many concerns to the less powerful parties. In any event the main consideration of any country is the national interest and to what extent the national interest of Sri Lanka is protected is not known to the citizen as there appear to be no transparency and consultations with the professionals or the public for reasons not known to the citizen when the other countries demand transparency and promote investment and competition. Public consultations are a requirement in other states of the world during the initial stages of trade agreement. 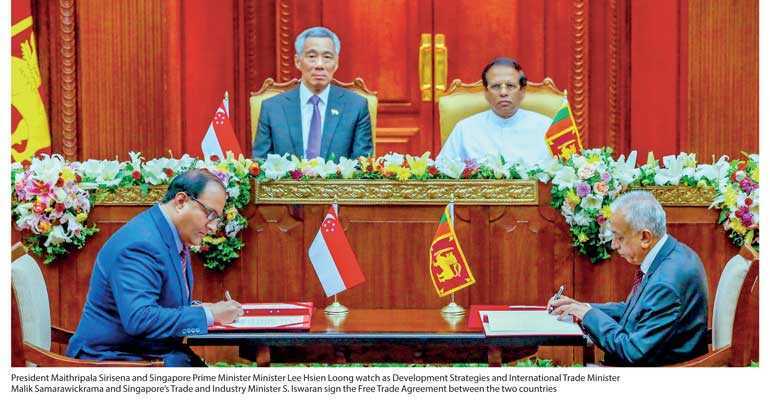 Singapore, which is the second fastest economy with 99% of goods with free access and FTAs with the USA and economic power blocs with unlimited liberty, will have free access to Sri Lanka in the implementation of other parallel agreements via Singapore. It appears the strategy of the GOSL may be to enter into as many agreements as possible to attract new investors. Will this strategy be effective and safe whilst protecting the national interest without other criteria to benefit/attract the prospective investors competing with the Free Trade Zones of other countries with better and more attractive offers? Singapore is given access to bid for local enterprises running at a loss with valuable assets which other countries with trade links with Singapore too will behalf to bid thereby Sri Lankan assets will be for sale to the world via the Singapore Agreement. Have we gained confidence of the investor as a host country equipped with natural beauty, educated/trained labour and good governance with peace and law and order for safety of the business community? Wordings in the Singapore document are extremely carefully drafted by expert drafters including the definitions of the citizenship of Singaporean to include persons with indefinite leave and free access to the business community and the companies registers in Singapore giving free access to the business registered in Singapore which is the most liberal country/economy with free access to the business world. Sri Lanka is anticipating greater access to the business world via the agreement and expecting investments, businesses and prosperity of the country in the new world of business.